GENEVA, Dec 14 2017 - Renowned global experts on the migrant and refugee crisis representing the International Organization for Migration (IOM), the United Nations High Commissioner for Refugees (UNHCR), the Geneva Centre for Human Rights Advancement and Global Dialogue (hereinafter “the Geneva Centre”), the International Catholic Migration Mission (ICMC), the Norwegian Refugee Council (NRC) and the Permanent Delegation of the Sovereign Order of Malta have today called for increased coordination and cooperation among decision-makers in the Middle East and North Africa region and in Europe to address the causes and the consequences of the migrant and refugee crisis. 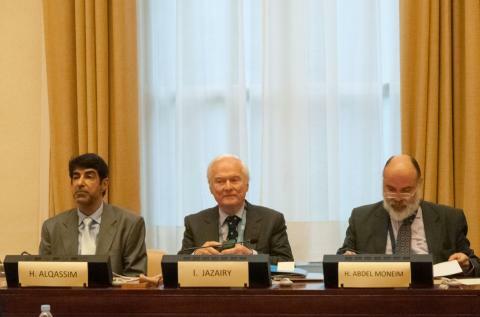 The Geneva Centre’s Executive Director H. E. Ambassador Idriss Jazairy acted as a moderator to the meeting and in this capacity spoke first. He called upon all member States of the United Nations to contribute to the realization of the UN Global Compact on Migration. He warned that the realization of global human mobility would fail if “multilateralism and consensus-building” would be replaced by “unilateralism and the fortification of societies”. He stated that the migrant and refugee crisis can be solved through dialogue, alliance building and multilateral diplomacy. In this regard, Ambassador Jazairy said there must “be a sharing of responsibility for hosting displaced people” to address the plight of people on the move and to support countries in the Arab region in their efforts to provide refuge and protection to people on the move. The moderator of the panel debate invited the Chairman of the Geneva Centre H. E. Dr. Hanif Hassan Ali Al Qassim to open the conference. IOM’s Senior Regional Advisor for the MENA region Mr. Hassan Abdel Moneim was also invited to deliver an opening statement on behalf of IOM’s Director General H. E. Ambassador William Lacy-Swing. In view of these observations, Mr. Moneim added that IOM has produced strategic framework document on Disaster Risk Reduction and Resilience “covering prevention, preparedness, response, recovery and partnerships.” These elements – he said – are key to IOM’s approach in providing a holistic and inclusive response to the multiple factors involving people on the move. “We must all stand ready to aid migrants, and to ensure social inclusion into ‘all policies. Migration is not a problem to be solved, but a human reality to be managed,” concluded Mr. Moneim in his intervention. Monsignor Vitillo remarked that HH “Pope Francis has spared no effort to join other religious leaders in a just and equitable response to forced displacement of peoples.” The efforts of HH Pope Francis to address the plight of Syrian Muslim refugee families in the Greek island of Lesbos and the human rights situation of the Rohingya people in Myanmar are concrete efforts by the Catholic Church to “put their faith into practice.” He concluded his intervention stating that the International Catholic Migration Commission is driven by the need to promote dialogue and cooperation between Christians and Muslims. In her intervention, H. E. Ambassador Marie-Thérèse Pictet-Althann informed the audience regarding the Sovereign Order of Malta’s humanitarian activities in addressing the plight of migrants and refugees in the Mediterranean Sea. In this regard, she noted that the medical teams of the Sovereign Order of Malta has assisted more than 50,000 people in rescue operations at sea. Ambassador Pictet-Althann also remarked that the Sovereign Order of Malta carries out humanitarian activities in countries of origin, transit and arrival such as Turkey, Lebanon, Syria and Iraq. It also provides counselling – she said – to refugees in overcoming challenges of daily life in host countries. Dr. Roberto Savio spoke on the misuse of religion and the rise of populism and xenophobia. He said that the decision of the US government to withdraw from the Global Compact on Migration contradicts the founding ideal of the US as a country built by migrants. Dr. Savio added that President Trump has “set a perfect example” for other countries in Europe to ignore the decisions of the European Union to address the plight of migrants. “Nationalism, populism and xenophobia are back with growing popular support and politicians openly riding them,” highlighted Dr. Savio. He concluded his intervention stating that a viable Europe relies on its ability to celebrate diversity and integrate migrants and refugees into its societies. In his intervention, Mr. Edouard Rodier assessed the response of the European Union in relation to the refugee and migrant crisis. He said that people on the move leave their home societies as a result of armed conflict, violence, starvation, misery and persecutions. “Those who are reaching Europe are claiming for a better life: a life where without fear, where fundamental rights are protected, where dignity is restored,” he remarked. Efforts to promote the protection of people on the move and contribute to the ongoing global efforts to enhance global mobility are needed more than ever. In this regard, Mr. Rodier added that “while we appreciate the political sensitivity of the topic, we need to acknowledge that solutions cannot be found in denial of this fact: migrations are here to stay.“ He concluded his intervention calling upon Europe to “take back its leading role in the defence of refugees’ rights” in light of the decision of the US government to withdraw from the Global Compact on Migration. In this regard, the moderator of the debate Ambassador Jazairy added that the former Chancellor of Germany Angela Merkel should be given the Nobel Peace Prize for her endeavours to respond to the plight of refugees and migrants and for welcoming more than one million displaced people to Germany. In addition to these observations, Ms. Goyer observed that armed conflict, violence and sectarian strives have led to increasing levels of displacement across the Middle East and North Africa region. She underlined that 28% of displaced people worldwide are in the MENA region including 2.6 million refugees, 15.1 million IDPs and returnees, and an estimated 372,500 stateless people. In relation to the efforts of UNHCR to address the plight of people on the move, Ms. Goyer noted that the world’s leading refugee agency has provided support to inter alia processing individual biometric registration for refugees, registration and documentation of births, enhancing national asylum legislation, access to livelihood opportunities and the establishment of community centres and mobile teams in the region in pursuit of sustainable protection responses. In her intervention, Ms. Ionesco stated that the adverse impact of drought, environmental degradation and ecological crises in the MENA region contribute to the rise of people on the move. The multicausality of migration – she said – must be recognised by decision-makers and reflected in migration policies to address the causes and consequences of displacement of people. The Global Compact on Migration has not adequately addressed – she noted – the adverse impact of climate change. In this regard, IOM has identified that drought, desertification, heat stress, rising sea levels and lack of water access will trigger forced population movements in the MENA region. These elements – she said – must be recognised by decision-makers in order to respond to the multidimensional factors that underpin forced climate migration. Following the intervention of the panellists, the moderator opened the floor to the audience. H. E. Ambassador George Papadatos – the Head of European Public Law Organization’s delegation in Geneva – asked the participants to identify a short political message that they would send to global policy-makers. In this regard, Monsignor Vitillo referred to the message of His Holiness Pope Francis on the occasion of the 104th World Day of Migrants and Refugees 2018 in which he called for the need to “Welcoming, protecting, promoting and integrating migrants and refugees.” Ms. Ionesco added her voice to the debate stating that people’s destiny is connected. People must understand – she said – that “we have one earth but it is how we treat the planet and the people concerned that make up the connections.” Lastly, Ambassador Pictet-Althann added that all parties concerned must be on board and agree on a common framework so as to advance the agenda of the Global Compact on Migration. In addition to these observations, the Permanent Representative of the Permanent Mission of the Republic of the Sudan H. E. Ambassador Mostafa Osman Ismail Elamin noted that “migration and movement is not going to stop. It is going to continue as life is going on.” The root-causes of forced displacement of people – H. E. Ambassador Ismail Elamin said – are man-made and related to political regime changes. In this regard, he referred to the situations in Myanmar, Iraq and Syria as examples of countries facing unprecedented levels of forced displacement of people owing to political issues. He called upon the United Nations to play a stronger role in establishing peace and stability. In relation to the observations made by the Ambassador of the Sudan, Dr. Savio said the world is undergoing a crisis of multilateralism. He called upon decision-makers to resort to alliance building and dialogue with global civil society actors to build a system of values and principles conducive to peace and stability in the world. Ambassador Jazairy noted – in this regard – that the Sudan was guided by the principles of human solidarity and international justice when Khartoum provided refuge and protection to refugees from Eritrea and South Sudan despite that the country was under heavy international sanctions. The Director of the Internal Displacement Monitoring Centre Ms. Alexandra Bilak added that the phenomenon of internally displaced persons has not received the political attention that it deserves. This issue – she noted – was excluded in the Global Compact discussions on migration and refugees. The majority of people who are displaced today are internally displaced people whom cannot benefit from an international protection framework owing to their status. In this regard, Ms. Bilak called upon decision-makers to pay greater attention to address the plight of internally displaced persons. The Director of the African Centre Against Torture Mr. David Koros noted in his intervention that migrants and refugees face torture and other forms of ill-treatment at detention and refugee camps particularly in transit countries such as Libya. He called upon decision-makers and international organizations to not turn a blind eye to situations in which migrants and refugees face grave human rights violations. – Journalist and author based in Norway: Mr. Halle Jørn Hanssen. The Geneva Centre will issue an announcement on 18 December on the adoption of the declaration in which further details will be provided to media and other relevant stakeholders.